Why use a USB flash drive as a mere data shuttle? The free CodySafe is one of the cleverest ways you can find to turn a USB flash drive into what the developer calls a "computer on a stick." Install CodySafe on a USB stick, and it lets you take applications along with you, managing them along with your documents and the drive itself. The beauty of this approach is that you can plug your USB drive into any computer, and never actually have to store data on the computer or use the computer's resources. With CodySafe, everything can be done from the USB drive itself. Install CodySafe on a USB flash drive, and when you run it from the drive, it looks very much like the Windows Vista Start menu. Install programs to the drive, and they show up on the CodySafe menu, just as they do in Vista; run programs by clicking on them. CodySafe also includes quick navigation to folders it creates, including Documents, Pictures, Music, and Video. CodySafe also includes features for managing your USB drive, including a "Drive Doctor" for checking the health of the drive, an applications manager, and a "Find-if-Lost" feature that lets anyone who finds the lost drive find out your contact information so that they can get it back to you. 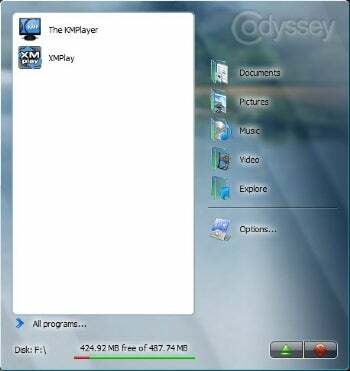 Vendor Codyssey.com also has a number of portable applications at their site that you can download for free to your USB drive, as well as links to other portable applications. Once you've got your USB drive set up the way you want, carry it with you, plug it into any computer, and you've got your applications and data, all within easy reach.